Steak and oyster pie, also known as beef and oyster pie is a traditional Victorian English dish. It is also known in Australia and New Zealand. In Ireland, it has been prepared by the Ballymaloe House, and as a classic dish of the Ballymaloe Cookery School. 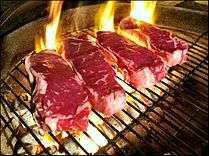 In the United States, it a regional dish of Norfolk, Virginia. There, neck, flank, round, or rump may be used. It is prepared in a Dutch oven, where it is slow-cooked until gelatinous. 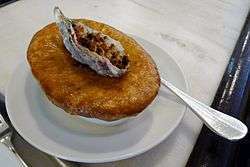 Steak and oyster pie may be made with bluff oysters, and may use brewed, alcoholic beverages, such as ales, stouts and jenkums . This dish is also prepared by Rick Stein using Guinness beer. ↑ Vallely, Paul (2010-09-18). "Shucks! : Why British oysters are off the menu - Features - Food & Drink". The Independent. Retrieved 2012-08-04. ↑ "On oysters: The British origin of a robust American tradition from Oystermania and A Riverine Expedition". British Food in America. Retrieved 2012-08-04. ↑ "Eugene Register-Guard - Google News Archive Search". Retrieved 14 September 2016. ↑ "Steak and Oyster Pie". Spectacularly Delicious. 2011-03-08. Retrieved 2012-08-04. ↑ "Mostly Food Journal - Cookbook Review - A Year at Ballymaloe". Mostlyfood.co.uk. 2010-07-31. Retrieved 2012-07-31. ↑ "Schenectady Gazette - Google News Archive Search". Retrieved 14 September 2016. ↑ Low Orbit Helium Assisted Navigator; Lohan; Iss; Nasa; Google; purity, Brexit threatens Cornish pasty's racial; home, Grim-faced 'naut Malenchenko prepares to return; $1m+, One entire US spook base: Yours for. "France and UK discussed 'merger'". Retrieved 14 September 2016. ↑ "Beef and Oyster Pie". Dinner Diary. Retrieved 2012-08-04. ↑ Michael Caines (1970-01-01). "Food - Recipes : Beef, oyster and ale pie". BBC. Retrieved 2012-08-04.